The breeder told us he's Maltese, but Maltese only weigh 4-7 pounds while he weighs 14. I know for sure he is not just a Maltese. He's very attached and hates other dogs and loves all the other animals and people. If a person walked inside and he doesn't even know them he will jump on them and lick them. I swear if someone was coming to rob our house he would be playing with the robber. His hair grows super fast but we never grow it out. He doesn't sit on our laps either. Friendly with everything but dogs. He very soft white hair and curvy tail. If anyone could tell me wht he is that would be great! Comments for What Maltese Mix is Shark? You can always have him DNA tested to ease your mind. Your vet should be able to do this. My last dog was a Wire Fox Terrier who was supposed to be 17lbs MAX. Most of the time he was around 30lbs. The lightest he ever was, was 24lbs, and that was right before he passed on at 14 years old. Good luck with Shark and enjoy his love! 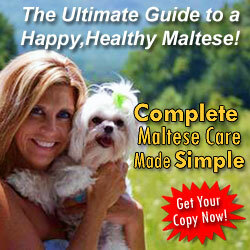 Maltese were actually bred down to size. Industry standards are just guidelines for a breed not absolutes. He looks like a Maltese from the picture. Have you asked your vet? 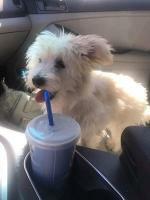 He looks similar to our Maltese , Cavalier King Charles mix..our dog is 17 lbs. Very lovable, smart, friendly only interested in our other dog. Doesn't care to play with other dogs unless he has meet them a few times. Slow to warm to other dogs. 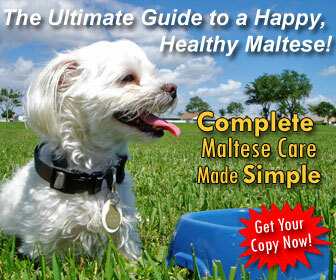 Your little Shark is a maltese.You have a Maltese. 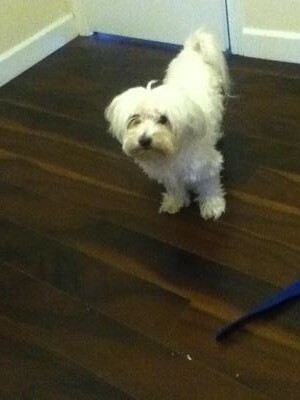 My maltese is 12 pounds. Its not a standard size. Puppies who arent the Breed Standard because of their size or color are not desirable. I am the person that usually ends up with those dogs.Love it all the more. You have a unique dog. He looks exactly like my morkie, Olive. You certainly have a smart and loving dog...that is all that matters really, thanks for sharing little Shark with us...these little creatures brings lots of pleasure and distraction to all of us Dog Lovers. keep ENJOYING her....She is in good hands..
Looks like our dog MiMi.She's a silky cocker spaniel Maltese hybred. All white except for some real lite Brown along her spine.My wife and I have had dogs all our married life and by far this is the best dog we have ever had. We get all our dogs at the humane society how we got this one still blows my mind. She was 7 weeks when we got her, other then the 1st 2 months of training her which was easy and getting to know each other she turned out to be extremely intelligent,lovable and very loyal. She knows her toys by name and will fetch them by name. As you can tell we love her. He looks to me like possibly a Lhasa Apso mix. He is adorable, whatever he is! Does it matter? He's a darling guy with an excellent name! 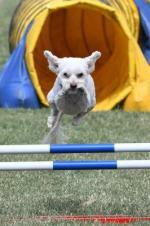 Your description of Shark sounds very much like my Daisy who is a Maltese Shih Tzu or MaliShi. So do love that little Maltese of yours....wish I could add a pictures of my little Niko but if you see the name you can see my message on my page title Niko.....Good luck with your little furry dog, just think you and I won't have to worry about them being too fragile.....Thanks for reading me.